San Diego State University officials and students Friday celebrated the opening of the renovated Nasatir and Storm Hall Complex. The event also included a dedication of two large classroom facilities within the structure, Charles Hostler Hall and the J. Keith Behner and Catherine M. Stiefel Auditorium. San Diego State University’s renovated Nasatir and Storm Hall complex. University photo. Programs from eight academic departments in the College of Arts and Letters will use the facilities, which have new and upgraded classroom technologies, academic and research laboratories, faculty offices and a small food service facility and convenience store. The project has been visible to students and basketball fans using the lower parking structure adjacent to Viejas Arena. The $73 million of renovations to upgrade the nearly 60-year-old Storm and Nasatir Hall began in June 2012. Improvements included compliance with the Americans with Disabilities Act, energy efficient windows, a new exterior finish and upgraded heating and air-conditioning system. 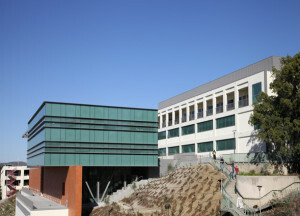 The structure is named after Alvena Storm, a geography instructor who joined the faculty in 1926, taught for 40 years and is regarded as an expert on the geography of California and the American West; and Abraham Nasatir, a professor emeritus of history, who taught at SDSU for 46 years beginning in 1928, and was known for his research on California history. Charles Hostler Hall is a 435-seat facility that will be used for classes, programs and events, according to SDSU. Hostler is a retired Air Force colonel who served as ambassador to Bahrain and financially supports the Charles W. Hostler Institute on World Affairs and international programs in the College of Arts and Letters. The 252-seat auditorium named after Behner and Stiefel will also be used for class instruction and events. The active alumni donate to SDSU business and Latin American Studies programs.